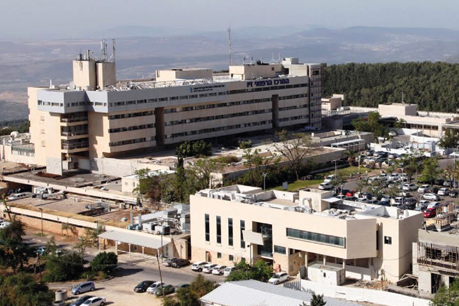 A new hospital for children has been established at the Ziv Medical Center in Safed, at a cost of 83 million shekel. The new hospital joins other specialized children’s hospitals operating in Israel, like Dana, Rappaport and Schneider, and is actually the first hospital located in the country’s periphery. The hospital is spread over 6,000 square meters on four floors, all of which are protected against hostile attacks, and comprises the children’s wards, pediatric intensive care, emergency room for children and all children’s clinics, as well as offices, dining hall, study and game rooms, yard and garden, an auditorium hall and more. The project has been built in an innovative way and is designed along modern in order to create an atmosphere of “children’s world” with a lot of creativity and thought dedicated to integrating the landscape into the building. The rooms’ balconies offer enchanting views of Mount Meron. People at the medical center are convinced that the hotel-like environment and atmosphere will contribute to a better feeling for both visiting and hospitalized children. The project, which has been supported by Sarel Company from its first steps, is going to notably change the healthcare map of the North of Israel and for the first time to offer a protected hospitalization and treatment space for children. It also offers innovative services that prevent the need to travel to hospitals in central Israel. The children’s hospital will be a center of excellence integrated into the teaching process of the Faculty of Medicine in Safed and offering the students broader possibilities of specialization in pediatrics. The new children’s hospital will coordinate all medical services under one roof, providing the entire population of the Galilee and the Golan Heights with pediatrics services at the highest standards. Towards the opening of the children’s hospital, the medical center’s staff has been reinforced with pediatric specialists in various fields, innovative and advanced equipment has been purchased. and new services have been launched that would provide all residents of the Northern region with an appropriate and wide response under the same conditions as in the center of the country. Since the children’s hospital is protected, operations and treatments may be also held there in emergency situations. The space vacated upon moving the pediatric departments to the new building of the children’s hospital will be used to lighten the hospitalization burden of the medical center’s other departments. For more details please contact Roni Kleiner, manager of the Institutional Department, at 09-8922070.